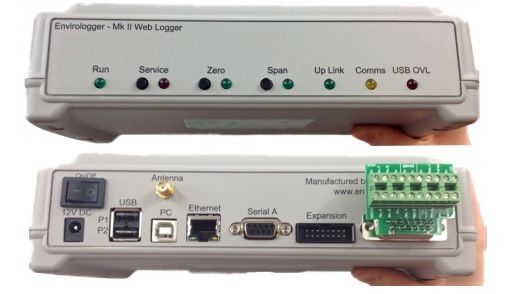 The Envirologger Gateway is a low power solid state system designed to connect any type of monitor or sensor to a cloud based data network. The Gateway is an exceptional piece of equipment to perfectly compliment your Fidas monitoring system and to bring another step of quality and convenience to your monitoring applications. It consists of an internet router, cellular modem, wireless transceiver, data logger, and control system all managed by a powerful microprocessor in one small DC powered box. Running its own operating system, designed specifically for remote sensing, allows the ability to communicate digitally with almost any monitor or sensor managing data collection and to provide remote control and diagnostics capability. Up to 256 channels of data can be collected from any number of monitors or sensors which can be connected by both digital and analog interfaces which can be wired or wireless. Each channel can be configured with its own communication and averaging rates, alarm levels, and diagnostic information. The gateway is pre-programmed with most environmental monitor protocols from the leading manufacturers making installation and configuration an easy plug and play operation. An optional wireless transceiver utilizes license free radio and accepts radio inputs from up to 100 wireless nodes which can be connected to any sensors across a wide area. The Gateway provides faster data download as well as two way communication with the connected monitors and sensors allowing clients to remotely manage the network operations and diagnose problems online. This approach provides an opportunity to reduce costs and site visits while maximizing data capture and quality.